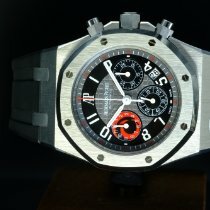 Een haast ongedragen Audemars Piguet Royal Oak, deze weinig voorkomende City of Sails, slechts 200 stuks, uitvoering is in schitterende staat. 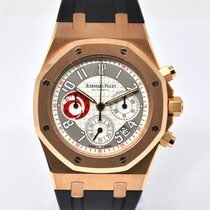 A very nice and very desirable Audemars Piguet Royal Oak Chronograph, this stunning City of Sails edtion (only 200 pieces produced) is in an absolute minty condition. 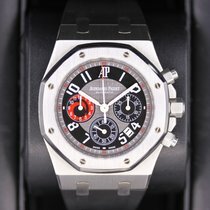 - We buy or trade-in watches, gold, jewellery and diamonds. - We buy,sell and trade on a daily basis. - All pictures we use are always from the actual watch. - Our trade-inn / pre-owned watches receive an in-store service/maintenance and a full quality control. 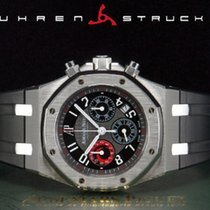 - All our watches are available, to see or purchase in our store. - Payments in our store are by Visa or MasterCards, cash or bank wire. - We highly recommend to make an appoint, prior to your travel. - Online purchase / payments are by bank–wire or Chrono24 Trusted Checkout.